Située dans l’un des endroits les plus ensoleillés de Salt Spring Island, cette maison personnalisée est située sur un acre de terrain privé. Les vues à 180 degrés depuis le pont (et la plupart des chambres) sont des montagnes et de l'océan Pacifique. La maison a trois niveaux qui semblent en cascade sur la colline. La chambre principale a un lit king-size, une vue sur l'océan et la forêt (il y a souvent des cerfs visibles par la porte arrière / fenêtre le matin). Le maître a une salle de bain avec douche. La deuxième chambre a un lit queen size avec une vue magnifique sur l'océan. La troisième chambre a un lit simple avec un lit double dans une mezzanine accessible par une échelle. Au niveau supérieur se trouve également la salle de bain principale avec une baignoire profonde sous un puits de lumière comme point focal. Le niveau intermédiaire est la cuisine et la salle à manger, avec une entrée de boue / buanderie et une petite terrasse de barbecue privée. Il y a deux grands puits de lumière qui fournissent une lumière naturelle brillante à ce niveau. Un niveau plus bas est le salon avec un mur plein de fenêtres et des portes françaises donnant sur le grand patio panoramique. Il y a des canapés confortables, une cheminée à bois, une télévision grand écran avec wifi dans toute la maison. À une courte promenade de 15 minutes de la plage de Baker, vous pourrez vous y rendre le matin ou le soir après le souper. En haute saison, nous demandons un séjour minimum de 3 nuits de juillet à septembre, week-end prolongé. Une suite de propriétaire complètement séparée et indépendante au premier niveau, le plus bas de la maison. La maison ne peut pas être utilisée pour organiser des mariages ou des événements. 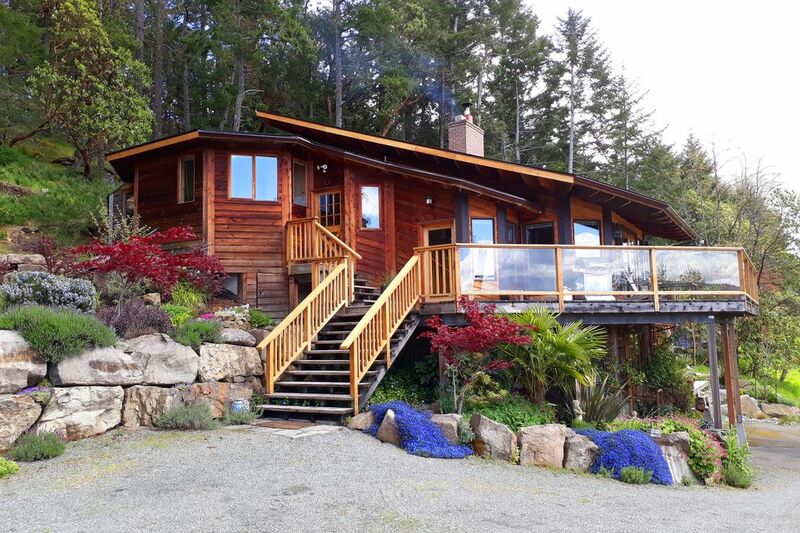 We spent a delightful weekend with our son, his wife and two grandchildren at this delightful home on Salt Spring Island. It is well-equipped, warm and inviting, plus having a gorgeous view available from its balconies. The owners are welcoming and helpful, and also live in a separate lower level, just in case help is needed. We hope to return in the future. We really enjoyed our stay here.The owners were very friendly and responsive. Th house itself was gorgeous, with a great design, much beautiful woodwork, comfortable furniture and beds. Every amenity you would need for comfortable stay, included a well equipped kitchen, was present. This was our first time on salt Spring Island, and we enjoyed the various parks and lakes. Highly recommended! I simply cannot say enough about this amazing house. Such a beautifully built home, exceptionally clean and well equipped with a gorgeous view from the deck. Rhonda was friendly and gracious. The beds were so comfy and the layout was perfect for our party of 5, including my 85 year old mother in law and 10 year old son. I can’t recommend this house more highly and we will definitely be back!!! A group of old friends converged on this lovely home for a week-end in early June (2018). With two bathrooms and three bedrooms, there was room for all. Of note: the two end bedrooms (one w/ensuite) are suitable for adults and the smaller middle room w/loft is well-suited for kids/youth. Essentially a three-level split (bedrooms & bathrooms on one level; dining, kitchen & laundry on one level; and the living room w/deck access on another), the home has a wonderful deck that offers great views and plenty of access to the sun. The home was very well equipped with a good supply of towels, kitchen implements, a number of condiments, a BBQ, Adirondack chairs and patio set on the deck, kindling & wood and even some laundry soap. Bright and airy, there were many access points to the lovely yard (we counted a total of five doors) where an array of perennial plants were in bloom. Hosts, Rhonda and Brad (who live in the lower level) were un-intrusive and left a card with wine, cheese, and crackers as a lovely and warm welcome. The home is nicely situated between Vesuvius and Ganges - arguably the best climate on SSI. Recommend? Most definitely. A group of 6 of us stayed in this house for a weekend in June. The house is very beautiful, with a unique design. Big spacious living room and kitchen, perfect for a small group of people to spend time together, but have their own space too. The area is incredibly quiet, and has an amazing ocean view! While staying in this house my friends and I were already talking about a future trip here! The house was bigger than expected with new excellent beds, altogether very comfy for 4 adults. There's a nice view of the ocean, eagles overhead and deer that wander through. Brad and Rhonda made us very welcome. Luckily the weather was spectacular. It is very hilly, so biking was possible only for the very fittest. Salt Spring is one of the larger Gulf islands and has a lot to offer--so it was a wonderful week with lots to see and do. We'd happily return. Marché hebdomadaire très populaire des fermiers, du fromage Salt Spring Island et des vignobles locaux. Vous pourrez admirer le coucher du soleil sur la plage voisine du Vésuve (des planches peuvent être louées et livrées). Vous pouvez également réserver votre dîner dans le patio du restaurant Seaside au coucher du soleil sur le Vésuve. Le kayak autour des baies est également une activité très populaire.